Georgia was going a little stir crazy after being kept close to home since her surgery so we made a short, non-strenuous, road trip over the weekend. 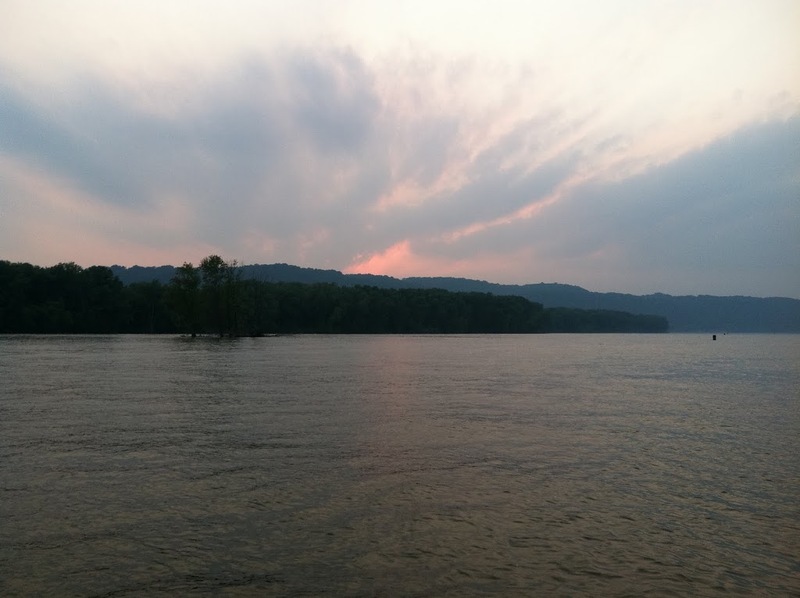 We drove to Prairie du Chien, Wisconsin and took two cruises on the Mississippi River. 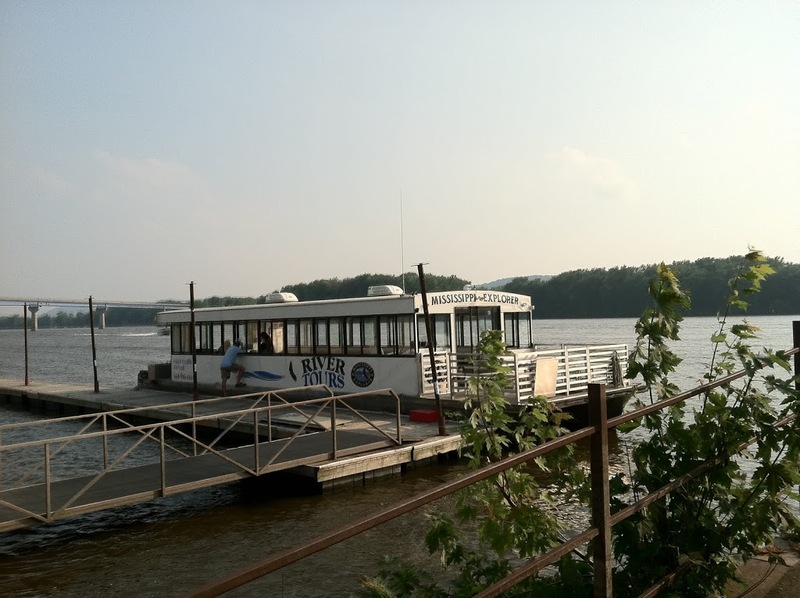 We left home Saturday morning and, after driving through heavy rain as we neared Prairie du Chien, got to the Mississippi River Explorer Cruises boat dock about 1 PM. Georgia had already made reservations for the evening music cruise but, since we were in time, we also got tickets for the 2 o’clock eagle watching tour. By now, the rain had passed so it was sunny and very hot. We were glad when the boat got moving to give us a little breeze. This trip went north from the dock. We went by three bald eagle nests each of which still had young eagles in the nest or nearby. 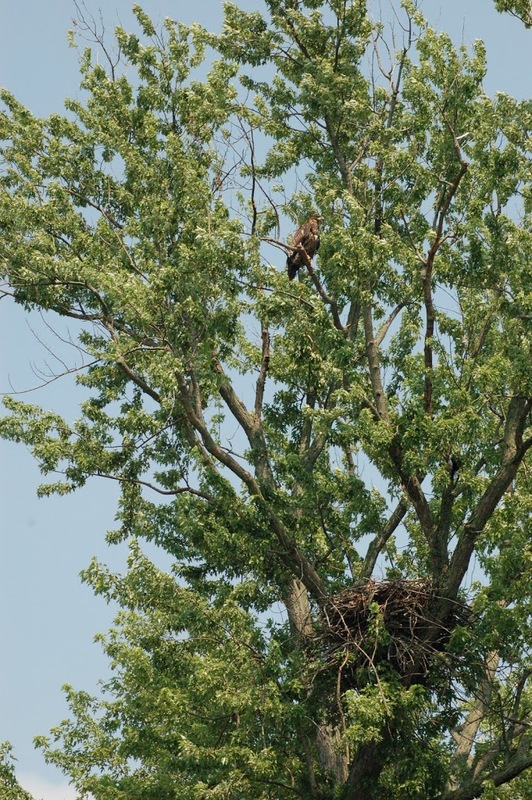 By this time of year the eaglets are pretty much fully fledged but still hanging out around the nests. The only adult eagles we saw during the 2 hour trip were flying over the river or perched on trees away from the nesting areas. Birds were about the only wildlife out in the heat of the day. We spotted one belted king fisher and a few more common birds. The boat went by a couple beaver lodges but the animals were out of sight. The upper Mississippi River is very different from the lower river. Below Cairo, Illinois the river is mostly confined to the main channel by dikes and levees. North of there, the Mississippi is far less constrained and widens out into many backwaters and sloughs that create thousands of islands. This afternoon cruise took us along both the main river channel and into some backwaters. We got back to the dock at 4 PM and went to check into the hotel and get some dinner before the evening cruise. We ate at Huckleberry’s Restaurant which proved to be a very good choice. I had a pork fritter sandwich that was huge and Georgia was able to get cottage cheese and soup that fit into her still very restricted diet. Then we made the short drive back to Saint Feriole Island and the boat dock. The evening cruise was very different from the afternoon trip. This one was a music cruise that featured Denny Garcia and Patsy Wellman. This time we went south from the dock and the boat stayed in the backwaters for most of the cruise. Sometimes the banks were so close that we could have reached out and touched the tree limbs. We went as far south as the mouth of the Wisconsin River – a very historic spot since this is where French explorers Louis Jolliet and Jacques Marquette first reached the Mississippi in the seventeenth century. This is also where Zebulon Pike crossed the river. When he arrived here he saw the high bluffs on the other side of the river and named the tallest Pikes Peak. Later, of course, he would reuse the name for the much taller and better known mountain in Colorado but, the Iowa bluff also still claims the name. From here we turned back north and slowly made our way back upstream listening to the wonderful blues and folk music Denny and Patsy entertained us with. I have to say that music on the river is a special treat. 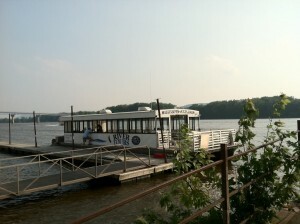 If you are near one of the Mississippi River Explorer ports that features music cruises you should give it a try. 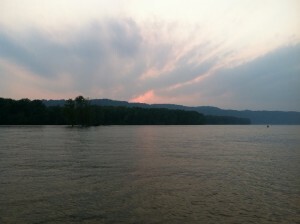 Sunset comes early to the river as the sun sinks behind the bluffs to the west. We pulled into the dock as the last orange streaks faded from the water and the sky. We slept in Sunday morning then drove back home getting there in the early afternoon. It was a nice first post surgery trip and shows that Georgia is doing well. Next week comes a bigger test when we go to AirVenture for four days. Looked like a great way to spend the day! Very nice sunset picture to tie it all up.